“Pray you love, remember.” Ophelia may have pleaded with her brother to remember their father’s death while she teetered on the brink of madness, but rosemary was anything but forgotten in Hamlet’s day. In fact, the herb has long held a reputation for enhancing memory, honoring the dead, and scattering negative vibrations to the four winds. Rosemary is no less important in our culture today, where it is useful in helping us to forget the discomfort of arthritis, muscle aches, and many skin conditions. One day, rosemary may even provide the key to restoring memory loss from Alzheimer's disease. Rosemary (Rosmarinus officinalis) is a woody evergreen native to the Mediterranean and a universal symbol of remembrance used to honor those who have passed on. The tradition of laying sprigs of rosemary across the coffin or upon a tombstone dates back to ancient Egypt. This custom continued well into the medieval period and beyond. For instance, Shakespeare’s Juliet was bestowed with rosemary upon her untimely death. In Australia, where Anzac Day is celebrated in remembrance of one’s family ancestors, it is still customary to wear sprigs of rosemary today. Rosemary is also associated with enhancing memory and recall. Shakespeare's Ophelia petitions Hamlet with, "There's rosemary, that's for remembrance, pray you love, remember." Scholars of ancient Greece wore wreaths of rosemary about the brow to help improve recall while taking exams. This reputation has earned the herb a place among traditional wedding herbs used to grace the bride’s bouquet, headpiece, and dress. Wedding guests are also given sprigs of rosemary to wear to help them remember the occasion. It was also once common to add rosemary to the couple’s wine to help them remember their sacred vows to each other. At one time, it was customary for the bride and groom to plant rosemary near the marital threshold on their day of matrimony. However, the old saying "where rosemary flourished, the woman ruled," prompted some husbands to pluck the plant from the ground lest anyone should think he wasn’t fit to rule the roost. Perhaps this is why the practice fell out of favor by the late 15th century. Rosemary takes its name from the Latin ros maris, which means “dew of the sea.” This is likely in reference to the herb’s preference for growing along the seashore of its indigenous domain. The Spanish began to call the plant Romero because they believed that another Mediterranean native took refuge beneath a large rosemary bush to shelter herself and her young son as they fled to Egypt to escape Herod. In honor of this brave, young woman, the plant came to be known as Rose of Mary, which was eventually shortened to the modern name familiar to us today. During the Middle Ages, rosemary was thought to be capable of dispelling negativity. As such, it was tucked under pillows to thwart nightmares and visits from evil spirits. It was also burned in the house to keep the black plague from entering. Perhaps this association with protection is why rosemary is still a common ingredient in incense used to cleanse sacred spaces. It was also thought to promote prosperity. In fact, 16th century merchants would often hire perfumers to infuse their shops with spirits of rosemary. The herb was also a popular addition to nosegays, wreaths, and other floral displays to encourage happiness of home and hearth. Medicinally, rosemary has a wealth of uses, both old and new. In one of the earliest herbals known to be printed in England, Rycharde Banckes recommended that one gather leaves of rosemary and “…boyle them in fayre water and drinke that water for it is much worthe against all manner of evils in the body." Indeed, rosemary was once thought to be a cure for poor digestion, migraine, joint disorders, and muscle aches. In fact, Queen Elizabeth of Hungary was reputedly cured of semi-paralysis when she sipped a concoction of rosemary to ease her painful joints. Hence, this formula came to be known as the infamous Hungary Water. 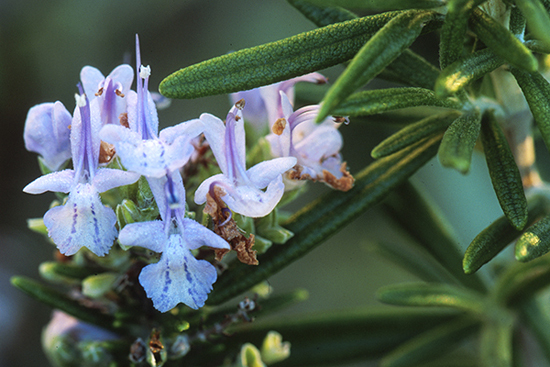 Today, rosemary is recognized as possessing several medicinal properties. For one thing, the plant contains salicylic acid, the forerunner of aspirin. This may explain why massaging the oil of rosemary into joints effectively eases arthritic or rheumatic pain. It also contains antibacterial and antimicrobial agents, and is used by modern herbalists to treat a variety of skin disorders, including dandruff. Rosemary is also being studied for its potential anti-cancer effects since initial studies indicate that its compounds inhibit carcinogenic chemicals from binding to cellular DNA. Rosemary may also become useful in preventing and treating Alzheimer's disease in the near future. Researchers have discovered that certain phytochemicals in the herb prevent the degradation of acetylcholine, an important brain chemical needed for normal neurotransmission. A deficiency of this chemical is commonly seen in Alzheimer's patients.